I almost forgot about posting this pre-holiday creation. (There's another pic on Flickr, because you might have noticed I'm a bit Flickr obsessed these days). 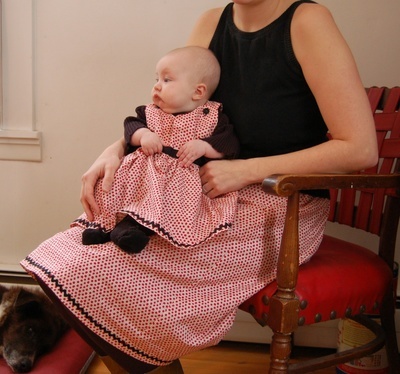 A matching dress and skirt for Mama and Adelaide. Matching bowties have been requested from Sir Calvin for he, Ezra and Papa, but I ran out of time (they'll come soon!). Yes, a family of matching clothing....I'm like that. I can't stop myself. So, this dress for Adelaide was free-form, without a pattern--not always the best idea, but it seemed to work okay this time, even though it's a bit large. You can't really see, but I used some sweet black vintage buttons at the top, and grossgrain ribbon over the gathers at the middle, and then rick rack of course at the bottom. My skirt is from the "Cute Skirts" pattern by Favorite Things, with an elastic waist back and a waistband on the front. The pattern was great, but I think this might be the last skirt I make with elastic--I don't like the way it puckers and enlarges the hips. Ahem. All in all, a very fun project to work on, especially as I was completely in love with this fabric, and of course, the young model for whom the dress was being made.